Nursing Burnout: A Relationship to the Definition of Insanity? By now, many of us have heard of Einstein’s insanity quote. Albert Einstein said “The definition of insanity is doing something over and over again and expecting a different result.” Is nursing burnout any different? Well, raising my hand here. Just this past fall, I found myself in the insanity trap. I have been wearing glasses for distance since the fourth grade. I will never forget my first pair- bright pink, with speckles. I was so proud of them. And then so upset when the kids in my class made fun of me for wearing glasses, calling me “four eyes”. Well, in September, I decided it was time to get new glasses. Though I loved them, the lenses were all scratched and the prescription had become weak. So, I went online to Warby Parker. No, not an affiliate link. A previous boss at work turned me onto this website. How convenient… They ship five pairs of glasses to you so that you can take some time to try them on and wear them around the home. I love it because it helps me see the prospective glasses with various outfits, lighting, and hairstyles. My five pairs came in the mail and I was super excited. I even brought them with me to Cape May, NJ while visiting my parents. One Saturday at breakfast, I put one of the new pairs of glasses on. Nobody said anything. So I tried another pair. And another and another. Finally, on the fourth pair my mom finally asked, “Are you wearing different glasses?” DUH!!!! What happened next was an eye-opening experience. My parents and husband all said that the five pairs of glasses I picked out were so similar to my current pair of glasses that they could not tell any difference at all. Hmm…. Definition of insanity? I think so! What had happened was that I was choosing glasses so similar to the current pair that I was not making any changes. Nobody could tell! And I realized that the only way to shake things up was to choose extremely different frames. I sent all five pairs back and tried again. This time, when I chose the glasses to be sent to my home, I picked the frames that I would NEVER think to pick out! The box arrived and I started trying on the glasses. Boy, did I feel funny! My face looked weird and it was extremely blatant that I was testing out new frames. The minute anyone saw me with the prospective glasses on they immediately knew that something was different! This was a conscious choice. A break from the same old glasses frames. Going a completely different direction to get… Wouldn’t you know it… Different results! A challenge many of us as nurses face is the workaholic syndrome. In fact, I talk about this in my book and presentation, “Stop Nurse Burnout”. Being a workaholic as a nurse is a bit unique than any other profession. I will use my husband, Drew, as an example here. Drew is a heating and air-conditioning technician. He drives a big van, uses a lot of tools all day, and works with his hands. When Drew comes to the dinner table with me at the end of the work day, does he bring his hammer, level, or drill? Of course not! But as a nurse, this may or may not be the case. We teach patients using our voice. We turn, lift, clean, and fix with our hands. We empathize, advocate for, and care with our hearts. And- when you are a nurse, are you ever really “off”? People can always count on a nurse! It is as if our workday never ends. We care for patients, our own families, and our greater communities at large. 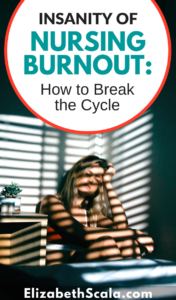 But if you are reading this and feeling the stresses of nursing burnout… and you think that putting the nose down and working harder will just help you push through… you are sadly mistaken, my friend. Working harder, pushing through, or simply ignoring how you are feeling and hoping that it will go away will not work out. Burnout will eventually consume all of your life. You may become physically ill or emotionally stressed. Work will no longer be fun and just getting yourself there will require every bit of energy in your body. There is no working through nurse burnout. The other struggle we face as nurses is the insanity definition stated above. In fact, here’s a real-life example of this. As a keynote speaker, I get the honor of giving talks to nurses and nursing students across the country. This past year was no different than any other- only that I presented more talks than ever before! After a talk in Oklahoma, I was contacted by a nursing student in the audience. We got on the phone for a quick chat so that I could answer her questions and give her more guidance than was able to during a 60 minute audience-style presentation. This nursing student is wise beyond her years! This happens to me- a LOT. After getting off of the stage at a talk in Indiana, a nurse came up to purchase Nursing from Within. She said, “What do you do when you do not want to do nursing anymore?” Since that question could take TONS of time to sort through and answer- I encouraged the nurse to email me and we could set up a time to talk by phone. As stated above to the nursing student asking me questions- this kind of thing happens often. Nurses tell me how unhappy they are, however for some reason, are unable to make lasting change. One thing I have noticed- even in my own life- is that as human beings we prefer the comfort of the known. And the comfort of being comfortable. 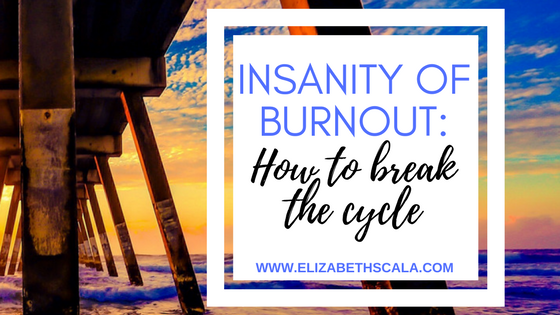 So, even if a nurse is experiencing nursing burnout, sometimes making a change is harder, more difficult, scarier, overwhelming, and any of the above than not making the change. The not making the change is known. We are used to it. It is familiar to us. If you are experiencing nursing burnout, and you REALLY, really want to see different results— then it is TIME to take action. Different action. New action. Action that you are even a bit afraid of. Changes do not occur by doing the same things over and over. Just think about my breakfast in Cape May and my modeling of my “new” frames. No one even noticed!! Not until I ordered and subsequently purchased glasses that were WAY different than the brown ones I had before. Sure, it was scary for me. My face looked a bit weird for days, even weeks. And yes… I got a LOT of head turns and double looks. But I was doing something different. I was stepping out of the comfort of the known. I was making a lasting and successful change. Thank you for this on nursing burnout. I think this is applicable to nurses, patients and clients, just about everyone. haha! I love the glasses example. Truth be told- you look awesome in ALL the glasses! Seriously though, thank you for bringing to light what happens often….doing the same thing, or a very-slight-barely-makes-a-difference-change in the ‘same old’ of life. A great reminder to be more purposeful if something is not working for us! Shared with my followers! Glad you enjoyed the example, Nicole. And thanks for the kind feedback! I too love the glasses example. I have been wearing glasses since kindergarten. So I can totally relate. It’s funny how we think we are making changes, but really we are doing the same thing over and over and expecting something different. Thanks for the reminder that if I want something different I need to take different ACTION.